Bravo Fr. Stephen. Well said. Is this the outline of a book on eschatology? Yeah….when are you going to write a book? I spent the evening being plied with these very questions by a teenage boy. Now I have something to give him that expresses very eloquently what I was haltingly trying to say — that he can know Christ here and now, and that this is what a sacramental faith means. Thank you. The concept of real participation in and synergy with God is a very difficult one to accept, particularly to the modern, western mind. How can it be possible for a perfect God who is beyond time and space to share of Himself and work together with finite creatures? Is this participation limited to our intellect? Does He share of Himself or merely by way of some impersonal force? Without the Eastern Orthodox understanding of the Divine Energies we enter a Two Storey universe of a distant God and secular man. But the good news is that God directly shares of Himself, we participate in God’s nature deifing our whole being, while we actively work together with HIm. Christ is in our midst! Thank you for all of your wonderful articles. You’ve given me a wonderful introduction for this year’s 9th and 10th grade orthodox education class on Church History, taught through the lives of the saints. Thank you. Also shared with my facebook friends, after Jim posted it on his profile. This will help the message get out even further. I have also shared it with two Church ministers I know, as the wider congregation who may not have use of the Internet would find it of interest. The mind is much happier working in the past or future, since they are both actually constructs of the mind’s own workings, and so the mind feels it can control them. The present moment, however, is completely outside its control, and therefore ignored. Unfortunately for the mind, the present momoent is the only moment which is, in any sense, real. Moreover, in spiritual terms, the present moment is the only possible occaision in which we can meet God (or anyone else). Within the Kingdom there is no time, simply eternity…or more plainly, only now. I think that it is only natural that whoever is looking at the issue of faith with empirical means – either for proving it or for discrediting it, will be making assertions or negations that will be inevitably and by default missing the point. If viewed as another story – another piece of litterature – the new testament presents a very formidable and unimitable character that seems to hold all the metaphysical keys to the koan – enigma – of human existence. This is a character of the profoundest depth and spirituality and compassion and love, that knows at any time what end is up – not another Moses ie a person that needs to keep in touch with God – but a person who is in fact in no separation whatosoever with God hence calls himself his son. Christ is a character that cannot simply be discarded by focusing on whether the miracles that are attributed to him happened or not, in the same way that any story, true or not, that functions as a myth (ie a revealing of inner truths, truths of the heart) too cannot, because even if the miracles can be doubted as events the character and the Truth he bears remain, and its very existence is far more miraculous and enigmatic than them. I think that of all people, writters understand this truth in an intuitive way – even ones that are not religious in the conventional sense, like say C. Bukowski. They understand well that its completely unimportant to try and find out if a person like this existed historically as its described or not – for them even if it is all a made up, the person still exists because, obviously, the author who “made him” was the knower of the profound inner truths the character holds. Someone knew all this, and if so its all true. In my opinion, the closer one is to the Truth, the more this is felt by others; Christ – as a scriptural character – was exactly spot on, and the rest is history. Anyone honest enough with himself that feels the ugly and complex knot of life and death, of suffering, of the poetry that is inherent in life itself, of the paramount importance and need for ontological meaning in the life of humans, will aknowledge that the scriptural Christ is a miracle in and by himself. PS Apologies F.Stephen if this is not exactly following the reasoning line of the orthodox theological view which i espouse. Thank you Father – brilliant. Thank you for putting into colours what Scripture does with words Father Stephen! All Scripture is a thick syrup — the elixir of Heaven — but to some it has the consistency of set concrete. A most excellent article, Fr. Stephen. Also thanks to Raphael for the lead to Fr. Meletios Webber’s article. Yes, indeed, both past and present, above and below – according to the Book and more importantly, in us- come together in Christ. I’ve begun alternately reading some of my favorite chapters among the epistles- Phillipians, Revelations 4 & 5, Romans 12, 1 Corinthians 13, 1 John 3, 1 Peter 1, Hebrews 12, 1 Thes. 5, and Colossians 3, which says we have died and risen with Christ and we are to “seek the things which are above, where Christ is.” The ascension and enthronement of Christ happened and is. Not that I’ve attained this, but at least when spiritual Fathers like you remind us, we can more earnestly refocus on this reality in Christ. Jason, et al. 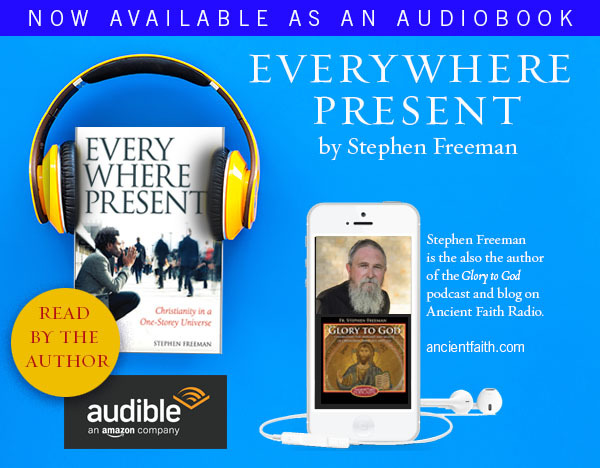 According to my editor at Conciliar Press: The book, Everywhere Present: Christianity in a One-Storey Universe, will be released on March 1, 2011. I expect other books to follow. Spectacular! I was hoping you would write something! Excellent news on the book! Thank you, and thank CP for publishing you. Thank you Fr. Stephen for this truly beautiful lesson. 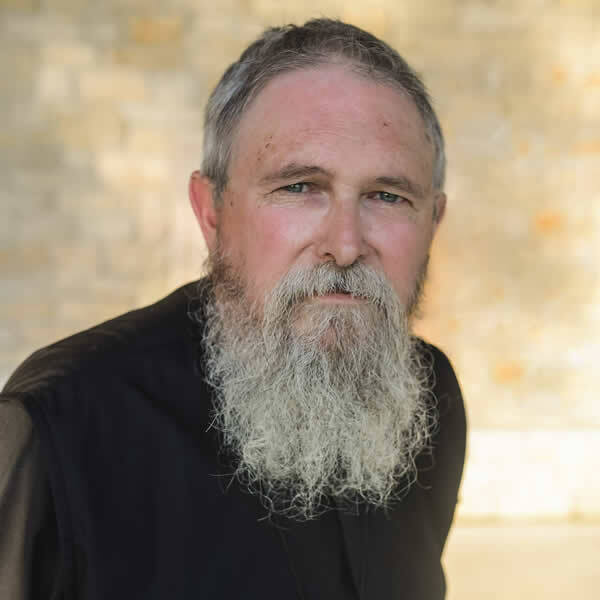 Father Stephen thank you and thank God for his ability to communicate His message through you and your blog! The title to your book suggests that an important element of your message will amplify and support these beautiful words. I’m not sure I need to go much further than this prayer…and this may be enough for my simple mind to be enriched with a lifetime of rich, always new contemplation. My experience has been that the daily, weekly, and ongoing cycles of the Orthodox services are divine doors which can through God’s grace make participation and communion with Christ move the 18 inches from my head to my heart….certainly, for my hardened heart the road less travelled. I eagerly anticipate your book and the way God will use you. Christ is in our midst and He’s breathed into your words to touch my life and change me. This parable explains the problem of sola scriptura, and modernism in general, much better than the traditional approach. This is not a new topic for me, but it put everything in much clearer perspective. thanks! Thank you for this great post, Fr. Stephen! It is indeed all too easy to miss the forest for the trees and shift one’s focus from God to something else, even if that something is scripture. This is probably one of the reasons God has always been so insistent on forbidding idolatry. Even the bible can become an idol, as can history, theology, etc. Enjoyed your thoughtful post very much on how Christianity forms us to be a people of Christ and not “people of the Book”. Also wondering if you have considered opening a Twitter account if you are not already on that SM platform? Readers of your blog are “tweeting” links to your posts ( that is how I found it), but it would be even easier to follow you if you had your own account. If you are looking at how to get started I found Elizabeth Kricfalusi at http://www.techforluddites.com very helpful to me as a beginner tweeter. In addition to helpful tips on her blog, she also took time to answer a question I sent her by email. Well done Fr. Stephen. Excellent title! Ah, yes! Let’s put Fr. Stephen in a box! In a very real sense, God is in the box (but only because He has chosen to make Himself “small” — else how could we approach Him? ).